The warning message when opening again Chrome. 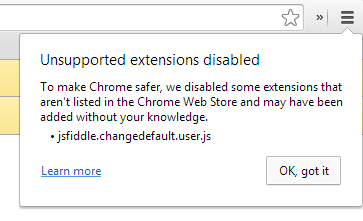 When you go to chrome://extensions you will see that the extension is now disabled and not working. You cannot enable the extension even if you click “Enable”. 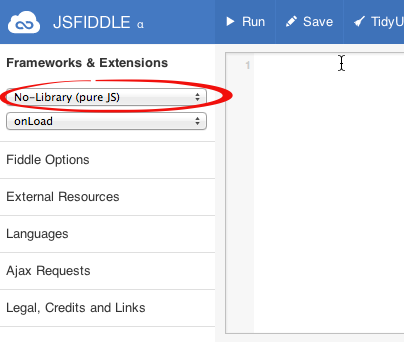 No extension means JSFiddle will default back to the “No-Library (pure JS)” library. User script has been disabled by Chrome. There was no way to enable it. When I posted How To Make JSFiddle Default To jQuery Library, it was my plan to convert the user script to a Chrome extension to be able to try and create a Chrome extension myself. I always imagine that someday I can create a Chrome extension and send it to the official Chrome Web Store so everyone can download it. So I think creating a Chrome extension will solve the problem of the user script being disabled since it is not from the Web Store. First, create a manifest.json file. This will contain the information about the extension. The existing extensions you have in your Chrome has their own a manifest.json file. They are located in the Chrome extensions folder C:\Users\[user]\AppData\Local\Google\Chrome\User Data\Default\Extensions. Then copy the user script to the same location as the manifest.json. Click Load unpacked extension… and then browse to the location of your manifest.json file. Press “Ok” and then you will notice that the extension is now installed and active from the Extensions page. 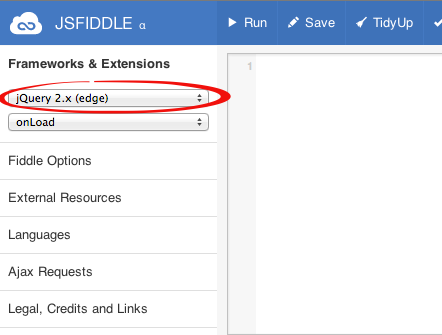 Now that the extension is installed, go to JSFiddle.Net. The extension made JSFiddle default to jQuery library when you create a new script. 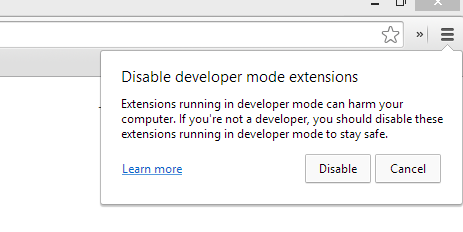 When you restart Chrome you might encounter a warning like the one below.